Sure it's a gigantic candy marketing tool, but it's also a game about a small creature navigating a human-sized world, and I love any game that lets me see the world from a smaller perspective — something to do with being 6'6" I'd wager. 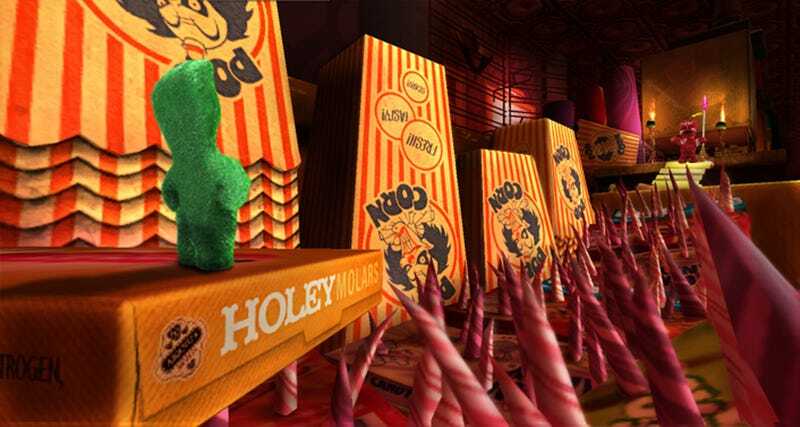 In World Gone Sour, players take on the role of a lost Sour Patch Kid, guiding him from the sticky floor of a movie theater to his ultimate goal — someone's stomach. Yum. Dammit, I want to be skeptical here, but check out the screens. Who doesn't want to be a little piece of candy, running around doing stuff? We'll know for sure this spring, when World Gone Sour hits the Xbox 360, PlayStation 3, and PC for $4.99 or 400 Microsoft points.